Hull City star Marc Pugh admitted that he’s very surprised with Wigan Athletic’s league standing ahead of tonight’s Championship clash at the KCOM Stadium. Having won their last two matches against Ipswich Town and Reading, AFC Bournemouth loanee Pugh said that Hull must simply focus on themselves in their unlikely play-off bid. “The wins against Ipswich Town and Reading have given us a boost, and we should go into tonight’s game against Wigan Athletic with confidence.” Pugh said. 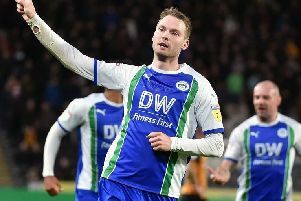 Pugh- who worked with Latics boss Paul Cook for a brief spell when he was at Burnley- said that he’s surprised that Wigan Athletic are in a relegation scrap. Meanwhile, Hull boss Nigel Adkins believes that his side should take nothing for granted against his former club tonight. “It’ll be a tough, tough game, Like Reading, they’re fighting for every point they can get right now. "Wigan have got plenty of threats but the other threat is the expectation with people just expecting us to turn up and win because of the run we’re on. "We’ve got to look to avoid that and keep concentrated and disciplined. "That’ll certainly be the message we’ll be drumming through to the players without taking away that spirit and enjoyment to play as a team. Latics will be searching for their first away victory since August 22 against a side that are unbeaten at home since November.